Eric Holthaus and Adam Sworob play acoustic ‘90s-rock-meets-hip-hop jams. efore I get too far into this show preview, I should offer the disclaimer that The Trebleshooters lead singer, Adam Sworob, and I have been friends nearly since the beginning of his residency in Bend. Sworob moved to Bend four and a half years ago and started working at G5, where I also worked at the time. I quickly learned about Sworob's musical talents, as he and his acoustic guitar came as a packaged deal on many group trips. Sworob, originally from Philadelphia, Pa., came to Bend by way of Portland. Over the last three years, he and his acoustic guitar have been a fixture on the Open Mic circuit, with The Lot and M&J Tavern being among his regular venues. 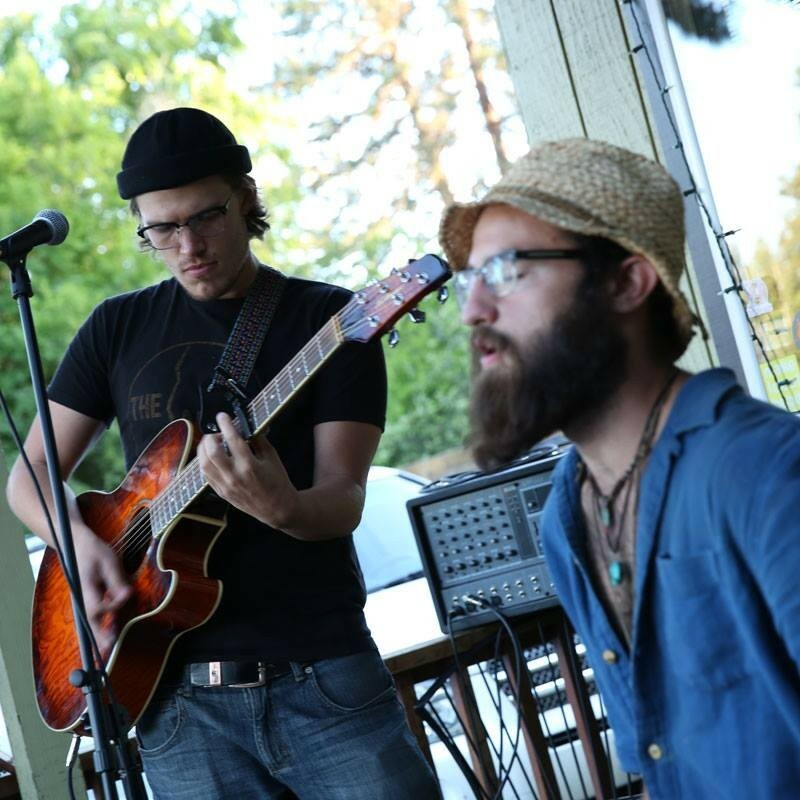 Through playing Open Mic nights, Sworob met Eric Holthaus and the two started jamming together. Holthaus, who plays the cajon, remembers jumping on with anyone who needed drums at Open Mic nights—including Sworob. "Everyone has their own version of music, drums could fit inside no matter what they chose," Holthaus says. "There's some sense of structure there. With music, it's about hearing it as a language and be able to speak it universally. I suppose that's my goal. to break everything down." When it comes to this dynamic duo, their genre has been hard to define, though they do incorporate '90s-esque indie rock with hip-hop elements. Here's the catch: they only play acoustic instruments, but wouldn't describe themselves as an acoustic band. "I think the easiest one to say is acoustic," Sworob says of the duo's genre. "I play acoustic guitar and Eric plays the cajon. I feel like the sound people associate with acoustic music is really far from what we sound like." hile most acoustic music brings to mind folk singer-songwriters and Americana music, The Trebleshooters turn the definition on its head. With rap-inspired lyrics and songs taking on themes of coffee addiction, dog deprivation and the "Three that Got Away," The Trebleshooters definitely aim for a light-hearted sound and performance style. "The lyrics are really a highlight to the whole project," Holthaus says. "I guess the best part about that is if you pay attention to the lyrics, you may catch on to an interesting story and a lot of clever word choice." Sworob typically writes the lyrics first and then the music. The songs are largely his ideas; Holthaus helps solidify the structure, often coming to Sworob with a chord progress, for example. The collaboration process has been even easier for the two, as they're now roommates. The duo plans to have a single out soon, including recording with Dayne Wood of Woebegone at his studio, The Firing Room. The guys currently have nine songs ready to go and hope to release their debut album, "Treble Starters I: Straight Shooters," by the end of the year. And if you like pun-y album titles and songwriting, you're in luck, because they have titles for the next couple albums already in the vault. "Here in Bend, there are so many really talented people, even at the Open Mic nights or playing around town," Sworob says. "They are pretty good, inspiring. We don't by any means have the largest community, but there's a lot of diversity and talent here. I can't wait to continue to be a part of it and contribute to it." M&J Tavern 102 NW Greenwood Ave., Bend.